I mean, it’s an okay view from the Spinnakers side patio. There is no brewery in B.C. with a location as picturesque as Spinnakers. The brewpub fills up a sprawling 130-year old house overlooking Victoria’s inner harbour, with a space that always feels inviting whether you’re there for brunch with your parents or late-night drinks with friends. They run a great “hoppy hour” and the pub houses a lot more than just a brewery: they also run a B&B, produce a variety of ciders, vinegars, jellies, & artisan chocolates, and have an on-site bakery. That, along with with its historic role as Canada’s first brewpub and a key milestone in B.C.’s craft beer evolution, gives it lots of warm fuzzies for any beer snob. But as charming as all that, we’re here to talk about the beer, where the verdict is decidedly more mixed. First, the good: for a brewery that’s been around as long as Spinnakers they remain incredibly prolific, typically offering 20+ of their own beers on tap at any given time. They make great hefeweizens, you usually can’t go wrong with core offerings like the lager, pale ale, or ISA, and a trip in the winter will have a completely different list of options than in the summer, no small feat. Unfortunately, inconsistent quality can turn their wide variety of offerings into a double edged sword. 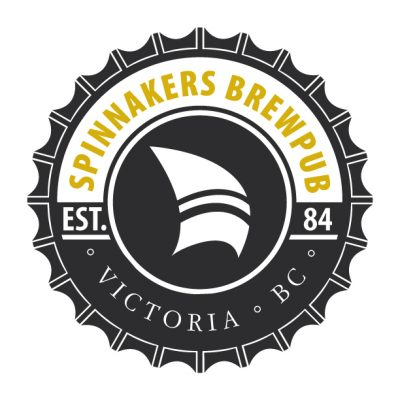 Unless you have a deep knowledge of Spinnaker’s back catalogue, it’s entirely possible to order a flight of 4 and end up with 2-3 watery or off-tasting brews in the bunch . Toss in the fact that they don’t don’t have a dedicated tasting station and never seem to have enough table service staff to really walk you through their beer menu, and it all adds up to an uneven experience. Which isn’t to say don’t go. Enjoy the atmosphere! Enjoy the pool table! Enjoy the history! Hopefully you enjoy the beers as well — but know there are several better options less than a 10 minute drive away.